We had spent a couple of really nice days in RMNP and the weather had been stellar during our time there to this point. Early September generally offers great weather after the summer monsoons have come and gone but before the fall snows roll in. This was indeed the case for us to this point. After climbing Sykes Sickle and The Barb on Spearhead the previous two-days we were sure of two things-We could easily make a car to car climb of the Petit Grepon and the weather would cooperate. The trails in this portion of RMNP were practically highways and the distances on the signs appeared to be inflated. Either that or we were hiking some really fast miles! So, with that in mind, we left our room at the Colorado Mountain School hostel in Estes Park around 5:15am and we headed up the Glacier Basin TH at 6:00am. A light cloud cover concealed the rising sun as we hiked in but we were hopeful the clouds would burn off. And they did. We passed by the Loch Lake a little after 7:00am and the sun was lighting up some of the surrounding peaks making for some nice reflections in the lake. We hiked on a bunch of broken up granite that is apparently the base layer for some new trail surfacing that is going in this fall. We arrived at Sky Pond a little before 8:00am and the sun was completely shining on the objective of our hike-The Petit Grepon. We took some time to study the features, take photos and marvel at the Cathedral Spires. 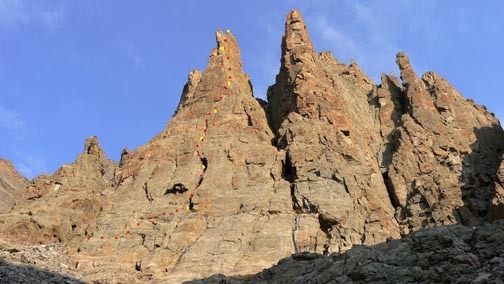 Tons of climbing opportunities abound on these spires! We found a decent climber's trail leading up the talus and scree to the base of the Petit Grepon. We opted to skip the potential first pitch of the route and traverse over to the base of the wide chimney of what would be pitch 2 if one climbed the initial 5.4 stuff from the true base of the formation. The traverse over was exposed but straight forward and we began climbing with Bill leading the big chimney pitch a few minutes before 9:00am. Bill leading up the big chimney of the first pitch..
Bill looked smooth and in control up the pitch and placed four pieces and clipped a stuck, new #3 BD C3 Camalot. That's one expensive cam to become a fixed piece! We would find at least 7 other fixed cams along this route-a testament to its reputation as the first big alpine lead for new trad leaders! I followed the pitch and joined Bill on the belay ledge. I led pitch 2 which, after making a couple moves left, become very exposed and steep. The climbing wasn't really hard but definitely got my attention because of the exposure and the difference between the rock and features here than on Spearhead. I led up to the second terrace and enjoyed a nice belay spot just below the chimney on the next pitch. Because of the waterfall flowing from Sky Pond, communication was difficult so Bill and I communicated via sharp rope tugs. In quick fashion Bill joined me on the belay ledge and commented to me about how the climbing here was much different than on Spearhead. Different rock features and different moves. Bill led the 5.5 chimney pitch and didn't stem once! Starting up the 5.5 chimney pitch. Me, on the other hand, stemmed a bunch while seconding it-I'm 6'5" so when a stem opportunity arises, I love to take it! 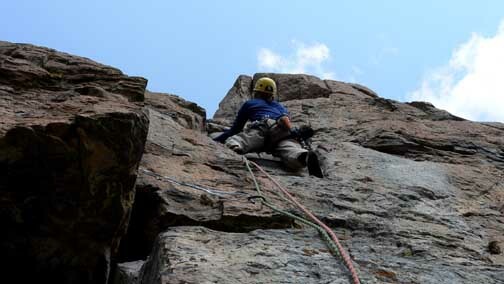 Seconding the 5.5 chimney pitch (above the chimney is fun face climbing.). 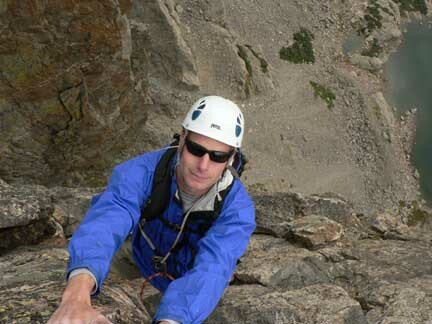 Bill soon called off belay on a sloping ledge with a piton as part of the belay anchor. The moves right out of this belay stance to get into the crux dihedral of the route were a bit interesting and certainly got my attention. But once up into the dihedral I felt better. I passed by an old, loose piton and clipped a fixed cam. Heading up the crux pitch to the line of fixed cams! Up a few feet more I came across another fixed cam and just moved my runner up from the previous fixed cam to this higher one. I stepped up and clipped another fixed cam below the crux of the route. I could see yet another fixed cam above and moved through the bulging crux and up to fix this highest fixed cam. One doesn't even need to bring her/her own rack for this pitch if you trust fixed gear! I continued up to the nice ledge on the SE corner of the Petit Grepon to setup the belay. It was a comfortable ledge but had some loose rock on it so I placed a nut and runner up above the belay a bit to keep the ropes from dragging on the ledge and knocking rocks down. As Bill seconded this crux pitch I watched the surface of Sky Pond and could see hundreds of fish coming to the surface and glimmering in the sunlight. It was very serene and surreal to watch the fish twinkle as little random spots all over the lake. 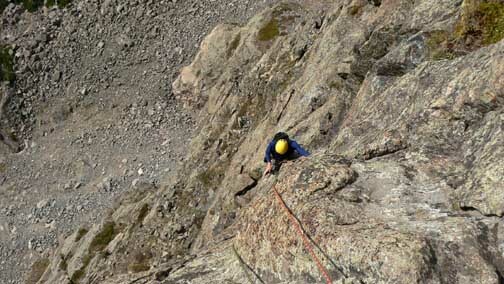 Bill joined me at the belay ledge and we surveyed the upper pitches of the east face. The face looked steep but nicely featured-we were pumped! Bill led up trying to stay 30 feet to the right of the edge as the route descriptions state but it looked good to climb anywhere and he was having fun just making it free-form. As our 60m ropes came near tight, I broke down the belay and yelled up to Bill that we were now simul-climbing. 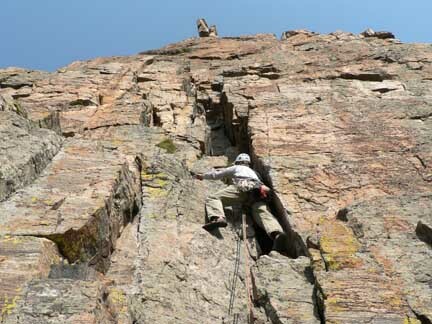 We simul-climbed for about 20 feet before Bill found a good ledge on the SE edge of the formation and setup a belay. This may or may not have been the famed "Pizza Pan Belay". I'm guessing it wasn't because it felt fairly spacious once I got there. 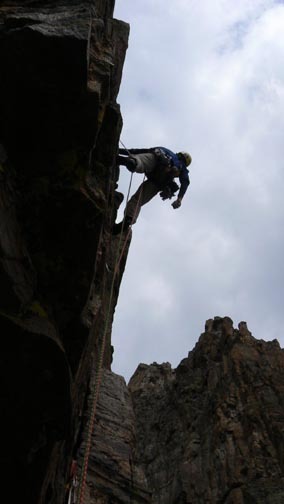 As I reached his belay, it appeared we were very near the summit and I figured I could probably top-out on the next pitch. I started off on lead on some steep but positive holds passing a fixed nut and fixed forged friend as I went up. The steep, fun and positive last pitch. I came across a great placement for an oppositional nuts placement and took advantage of that since it's pretty rare to find a placement like that. I carried on up reaching easier ground and scrambled to the summit around noon. 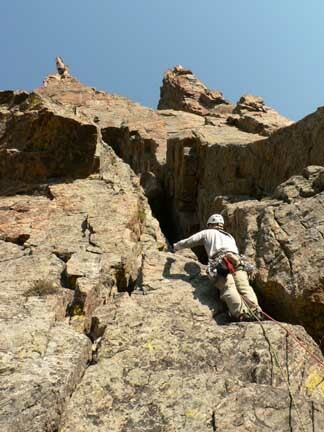 I was able to place a couple of large cams in cracks on the summit and settled into a nice positive sitting position and called down, "Bill, off-belay…and on the summit!" He shouted back, "Really? Well done!" I put Bill on belay and he climbed up to join me on the summit. Intense exposure from the awesome summit perch! On the summit the exposure was intense! Our perch was about 6 feet wide by 30 feet long with serious air on all sides. Looking over the west side it felt like the tower was overhanging and dropped for hundreds of feet. The sky was full of intermittent clouds that had started to build and looked dark to the southwest. We ate some cheese, pepperoni and crackers before starting the six double-rope rappels down via the "new" rappel route that avoids the gully descent. We had obtained a copy of the rappel route diagram from the NPS backcountry office just outside of Estes Park. The first rap was from good bolts on the north end of the spire down to good bolts for the second rappel. As we rappelled down we slowly turned from the east face to the south face again following bolts all spaced about 150 feet apart. The clouds were building and we could hear thunder in the distance. At one point small snow flakes fell from the sky for a couple of minutes. We reached the first terrace and our packs around 2pm and made good time to get down the scree and talus to avoid getting wet or worse, hit by lightning. We got back, uneventfully, to the trailhead and spent the afternoon at Starbucks in Estes Park sending email and catching up before heading back to our camp in forest service land near Meeker Park. Written by Jason Halladay on 01 August 2006 for TheMountainInstitute.com.